The monthly practice is at Winchester Cathedral next week, Wednesday 1st August at 7.30pm. I believe the route to the ringing room is different from the one you may be familiar with so it might be a good idea to arrive early. Coral Northeast – Basingstoke District member with friends in the District. David Underhill former ringer at the Clatfords. Ros Brandwood (treasurer) thanked all attending and explained that neither the Chair nor the Vice Chair were able to attend the meeting. She was standing in as acting Chair. The vicar and Churchwardens for the use of the church and the organ. Canon Harkin for taking the service. Gill Gardner for playing the organ. The Kingsclere ringers and Kath Gray for providing the tea. Barbara Townsend for organizing the day. Abbotts Ann members, Louise Wodehouse Clatfords. The minutes which had previously been distributed were agreed. Proposed Mike Winterbourne, seconded Lionel Clarke. Proposed Mike Winterbourne, seconded Brian Oakes. PN had sent his report which was read to the meeting. I know Helen is going to talk later about the District Practices, as she is concerned about the number of people attending them. I would like to thank her for the effort she puts into running the practices and assure her that this is greatly appreciated. At the same time I would encourage more people to attend. These practices are intended for all levels of ability, and if anyone has suggestions about how we can improve attendance, please let us know. We can all benefit by widening our horizons and ringing outside our local towers. The practices are of course one way, but I would also remind you of the Guild Education days, and there are also a number of ringing courses. It has been disappointing that yet again we have had no-one take up our bursary scheme. I may be sounding a bit gloomy, but on the positive side we had a very enjoyable outing to Somerset, organised again by John Simpson, Roger Thomas has continued running the monthly 8-bell practices at Hurstbourne Priors, and last year also saw the start of joint monthly surprise practices with the Oxford Guild. I would like to thank Tim for encouraging people to go to them, and for continuing to organize quarter peals. Also this year will be the 90th anniversary of the District, and it would be good if we could mark that in a way that brings us all together. I would like to close by thanking the other committee members whom I haven’t mentioned so far, Maggie and Ros for organizing it (and me) and Ros for standing in for me today. Recruiting and retention are a constant worry especially when we think to the future. Variable attendance of some newer members slows their progress. People are willing to come along to open days to find out about ringing but are unwilling to commit. Most towers are able to manage service ringing, weddings and funerals, often with the help of ringers from neighbouring towers. Andover can manage a monthly practice only. Having only 5 ringers they would really welcome support from visitors on practice night (2nd Tuesday each month). A few have managed to ring quarter peals for special occasions (WW1 commemorations, royal and family events and for church members who are moving away). Visiting bands also have occasionally rung QPs this year. A new kitchenette is in the process of being installed at St. Mary Bourne. No ringing is possible there at present but Hurstbourne Priors has welcomed the band to their practices. Abbotts Ann is pleased with the progress made and local interest expressed in their hand bell group. They have also started to ring methods! Whitchurch is trialing a terylene rope top to see if it will help in preventing breakages. The Treasurer reported on the accounts for the year ended 30th November 2017, copies of which had been distributed to the meeting. Ros thanked Carol Waller for undertaking the independent examination of the accounts. It was pleasing to note that membership had increased very slightly, resulting in a small increase in income. After deducting the amounts due to the Guild and other expenses, the District was left with a surplus of income over expenditure of £142 (£209 in 2016). The bursaries offered previously had not been taken up and it had been agreed to use some of the available funds to provide the tower fees for the district outing (£89). The balance carried forward at the year-end was £1,310.60. Adoption of the accounts was proposed by Helen Piper, seconded by Barbara Townsend and agreed by the meeting. HP explained that she had been discouraged by members who had not attended DPs or who had left venues early. DPs are designed to help members at the tower attended but it seems this is difficult to get across. She asked how members thought how they might be improved. Ringing Master to establish the required needs of the ringers from the tower captain – what their band would like to ring – what they need help with. This programme to be emailed to all towers prior to the practice. To try a Saturday morning practice based on one method perhaps, to take place twice a year, during the summer. All less experienced ringers need as much encouragement as possible to attend towers other than their own, and to attend DPs at their own towers. By keeping the emphasis on attendance at DPs it may persuade less able ringers that the support is there for them. Roger Thomas suggested that rather than initiating a new Saturday morning practice as a way to attract more ringers, it would be better to put more effort into encouraging attendance at District practices, as these are already arranged, with towers and people to run the meetings. Helen, Tim and Roger were all thanked for their hard work and dedication to providing the variety of ringing opportunities available in the District. At the 2017 ADM it was decided that the officers elected at the 2016 ADM would continue to serve until 2018 when the new rules (below) would be adopted. Year 2 – Vice Chair, Secretary, Ringing Master. Chair (currently Peter Niblett) No new nominations were forthcoming. Peter has agreed to continue. Proposed Mike Winterbourne, seconded Barbara Townsend. All in favour. Vice Ringing Master (currently Tim Pink) No new nominations were forthcoming. Tim has agreed to continue. Proposed Helen Piper, seconded Carol Waller. All in favour. Treasurer (currently Ros Brandwood) No new nominations were forthcoming. Ros has agreed to continue. Proposed Maggie Hiller, seconded Helen Piper. All in favour. Ros thanked Carol for her work. Carol kindly agreed to continue. Proposed Ros Brandwood, seconded Helen Thomas. All in favour. The task of these officers is to attend the Guild Exec meetings and disseminate information to District towers. Both officers agreed to continue. Proposed Brian Oakes, seconded Helen Thomas. All in favour. An annual meeting to discuss any aspect of the Guild. Any District member can attend. Both officers agreed to continue and would welcome any other members who would like to join them. Proposed Mike Winterbourne, seconded Maggie Hiller. All in favour. ‘The Meeting resolves that the current accounting period for the District be extended to cover the thirteen months ending 31st December2018; thereafter, the accounting year-end to be 31st December. Proposed by Ros Brandwood, seconded Maggie Hiller. After discussion the proposal was withdrawn. 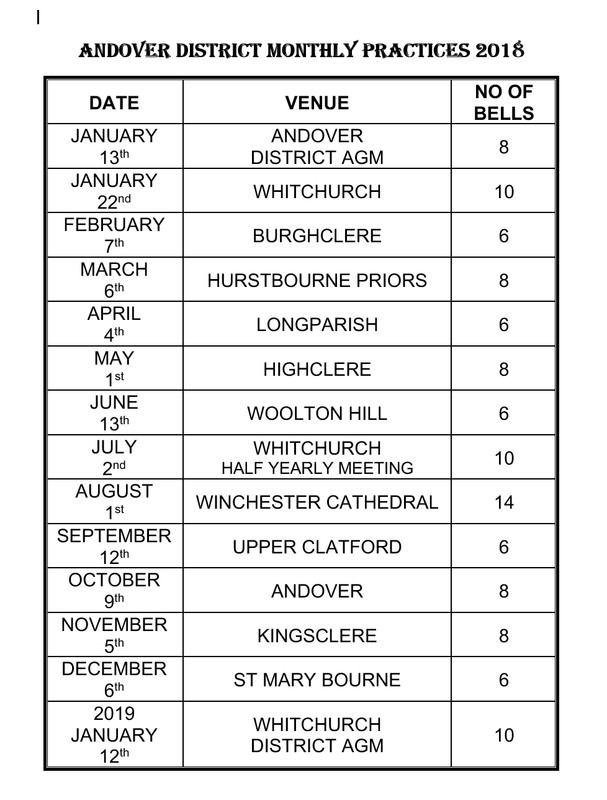 a) Monthly District Practices: Gill Gardner has agreed dates with tower contacts and drawn up the list of venues for monthly District practices. Two extra Saturday venues, mentioned in Item 7d will be added. MH to send copies to all members. b) Annual District Outing – Saturday 6th or 20th October depending on organizer. Do we have a volunteer to organize this? Christine Knights-Whittome outlined forthcoming events. Friday Evening 23rd Feb. at Bishopstoke ‘Basic Raising and Lowering’ (3 places remaining). Towers were encouraged to find suitable ways to mark the event. Firstly, I thank all those who take on roles in their towers and in their District for all your work. Are you using the communication paths available, so you do not miss any information? WW1 centenary approaching –How can you help? Have a look at your old tower records to find any ringing that commemorates a WW1 battle, or records the passing of a WW1 soldier. This need not be a Quarter just any ringing recorded in the tower records. Symbolic Replacements and a Living Legacy for the 1400 ringers lost during WW1. A call to new ringers to replace those lost during WW1. Local volunteers, through website, will be forwarded to District Secretaries who will hopefully find them a tower who will welcome and teach them. Check the website for information coming towards the end of January with promotional fliers and posters to advertise Ringing Remembered. Ringers have been asked to ring the bells on 11th November 2018 ideally at 11am. We know that even with Ringing Remembered supplying extra ringers will not be achievable in all churches, so can you start planning how we can get as many churches as possible involved during November 11th. Services will be held at Winchester and Portsmouth to remember those lost in WW1 and to present a book of the ringing in commemoration. Liable to be held at 3pm, Evensong. All ringers are invited. Each tower is required to inform the editor of the Guild Report how many copies are required by them this year. Please contact Ros Brandwood with your total. No new proposals have been received. To ring a QP at Burghclere on Sunday 11th November. To ring handbells prior to the service at Sandham Memorial Chapel on that date. a. Each tower is required to inform the editor of the Guild Report how many copies are required by them this year. If you are coming to the AGM and require a tea please contact Barbara on the number below. Note that it must be ordered by 6th Jan.
Orders for tea to Barbara Townsend by January 6thplease. NO ORDER – NO TEA! November DP will be held on Monday 6th November at 7.30pm, St Marys Kingsclere. Held at Whitchurch All Hallows on 25th September 2017 at 7pm. K/C – Gill Gardner, SMB – Eve Lind Smith, Andover – Barbara Townsend, AA – Dudley Alleway and band, Over Wallop – Lionel Clark, Tangley – Margaret Winterbourne, Amport – Matthew Holbrook. Peter Niblett (Chair) welcomed all attending. No Meeting minutes were available as this meeting has not been held for several years. Chris Caryer and Liz Thornton are leaving SMB on 28th September. We wish then good luck in their new home and thank them for all they have given to the District and the Guild in the past. Over Wallop – change of time for Sunday service to 9am, 1st and 3rd Sundays. Membership subscriptions are up on last year; more probationary members appear to be progressing to full membership. The district’s reserves are accumulating. Bursaries offered for training have not been taken up; ideas would be welcome. b. Funding (in part) helpers volunteering for Bradfield or Hereford courses. c. Could the tower fees (up to £100) for the District outing be paid using these funds? Motion c. proposed by Mike Winterbourne, seconded by Helen Thomas. Action Point: MH to inform John Simpson regarding upcoming District outing. It was asked if the Andover programme of events card prepared by RB this year would be useful if it continued for 2018. All in agreement. The DP list sent out at the beginning of the year is correct. Venues and times are confirmed apart from December. See Item 11a. AOB. Saturday 21st October 2017 – The Andover District Outing to Somerset/Wiltshire arranged by John Simpson (details attached). 30th September 2017 – District Members’ Forum. 9.45am St Barnabus’ Church Hall. 18th November 2017 – Exec Committee Meeting, St Barnabus’ Church Hall. All hand-outs – such as the Annual Reports, Guild Newsletters etc. will be handed out at the District practice meetings – so please make sure someone collects for your tower. A list of current handouts include Education Courses above and the Guild Report 2016 (beige colour). a. DP venue for December 2017. SMB has building work going on and will not be able to hold a DP. Longparish has been suggested as a suitable venue. The tower contact is in favor. Action Point: MH to request venue officially. b. It was agreed that this meeting had been of use in that new members had been voted in earlier that at the ADM in January and that it had provided a useful band for the 10- bell practice. Because of building work at St Mary Bourne in December they will be unable to hold the monthly DP. Many thanks to Longparish tower who has very kindly offered to step in. The time and date will be Wednesday 6th December at 7.30.
plus a form for tower secretaries to record any changes at the tower since the last Guild report was published. Please try and make it if you can. Mike Hopkins Till has brought it to my attention that there is to be a combined Andover District/Newbury Branch Surprise Major practice at Thatcham on Friday 8th September. The next District practice is to be held on Wednesday September 6th, 7.30pm at Longparish. Work is being carried out on the Guild website to simplify the way it is structured. We hope this will make the website easier to navigate for the members, and also easier for the correspondents to add news and information. Andover District is first, and if all goes well, then the other Districts will follow soon. If by any chance you notice any odd effects – please let us know (comment below) as we are happy to be assisted with the testing! Please watch for meetup instructions nearer the time – works on the Cathedral are making the usual rendezvous point problematic. If you’re planning to park inside the Cathedral close then you will need a parking permit. A limited supply will be available once the door to the bell tower is open. This month’s District practice will be held at Over Wallop on Wednesday 5th July at 7.30pm.